There are certain dining experiences that just make you feel like a New Yorker. Sitting at Veselka’s counter sipping coffee and dipping chalah into a bowl of soup exemplifies this notion 24 hours a day, seven days a week. Originally opened as a candy store in the mainly Ukrainian East Village of the 1950s, “Veselka,” Ukrainian for “rainbow,” has been spreading cheer amidst an ever-changing neighborhood by sticking to its roots: authentic and affordable Ukrainian food in an unhurried atmosphere. I’d be hard pressed to name another first course that’s as simple, satisfying and hearty as Veselka’s mushroom barley soup. And this is coming from an eater who’s not a big fan of mushrooms and had never eaten mushroom barley soup prior to this Fall. Now I can’t even consider a meal at Veselka without ordering this soup as my starter or even my entire meal. After buttering and dipping the two pieces of thinly sliced chalah which accompany my bowl of soup (only one slice with a cup), I fall into a tunnel-like trance of soup induced euphoria, letting the hearty mixture of plump barley and finely chopped mushroom and carrot overtake my senses. Intense, I know. But there’s something amazing about the fact that I find such simple pleasure in a dish my Russian and Polish ancestors once ate. Such is the power food possesses. 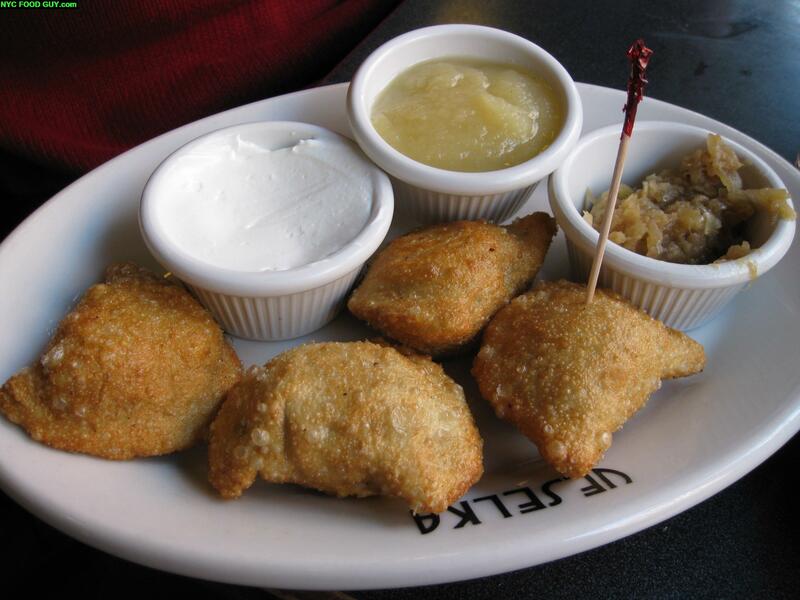 If you enjoy knishes and you enjoy dumplings (fried or steamed), then you’ll enjoy pierogies. Seasonal specials join Veselka’s 7 standard varieties of pierogie, each served with a side of bitter sauteed onions, but I stick with the classic potato, fried not boiled, and pay an extra $0.50 for sour cream and apple sauce, dipping between the two, creating a delicious confluence of flavor between the sweet apple sauce, the rich sour cream and the peppery potato filling. You can mix pierogie varieties to create your own sampler but I enjoy the slightly spicy potato because it contrasts the sweetness of the cheese blintze with raspberry sauce I always order. Prior to trying Veselka’s cheese blintze, every blintze I’d tried looked more like a mini grilled burrito than the airy crepe-like creation Veselka offers. 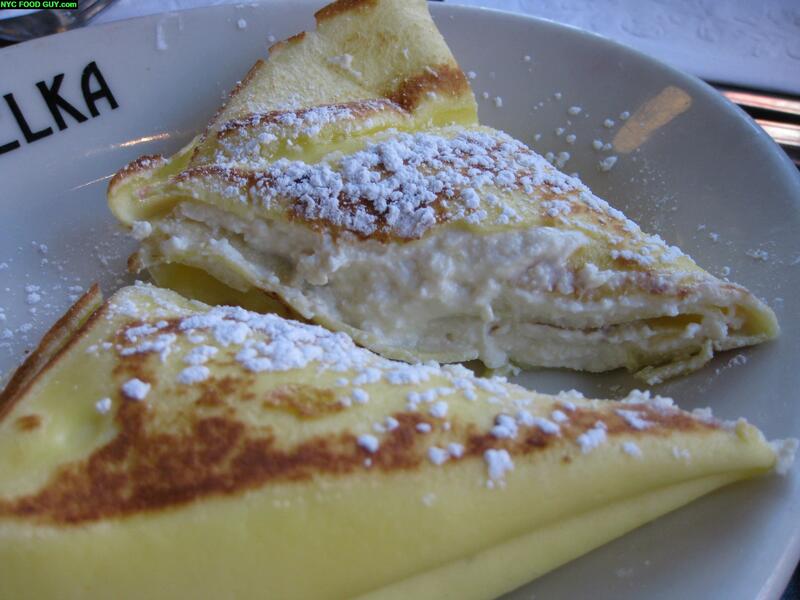 The delicate, confectioners sugar-coated pancake gives way to a sweet farmers cheese filling which embodies a faint lemon flavor. The refreshingly tart raspberry sauce combines with the sweetness in the pancake and cheese filling to provide a deliciously balanced flavor. Spoil your taste buds by alternating bites of the raspberry-topped blintze with the sour cream and apple sauced-dipped peppery potato pierogies (say that 5 times fast). A table can fetch a wait of 15-30 minutes on weekends stretching from breakfast until late afternoon. As a result, service can be a bit harried and soup arrives at the same time as pierogies and blintzes, thereby rushing the delicate flavor progression I’ve grown to love. 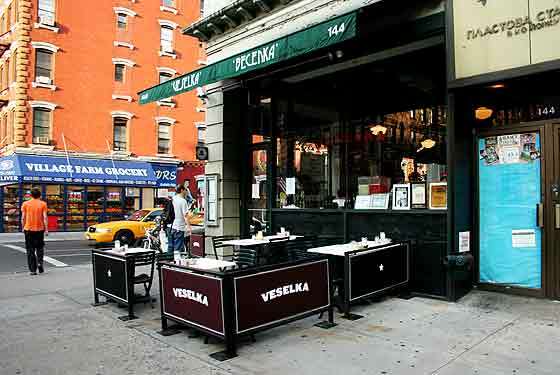 The good thing is that Veselka is open 24 hours, seven days a week and aside from Saturday and Sunday, getting a table or a seat at the counter is usually a smooth venture. this place has been a staple late night spot for me for the last few years… absolutely love it. their brunch is quite good too. have you ever tried any of their meat besides the burger? just wondering what a ukranian steak is like…..
Veselka is a fantastic place, one of the first dining experiences I remember after moving to NYC. My personal favorite is the beef stroganoff. Love the buckwheat pancakes at breakfast too. haha copywrite you are the man! Beef strokin’ off! that is hilarious. 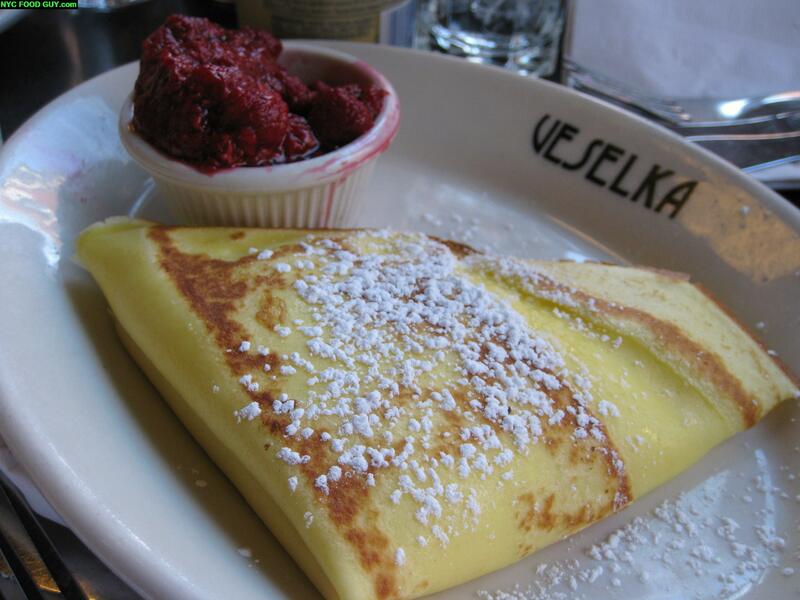 I always go the cheese blintz route when I’m at Veselka, but never tried the Raspberry Sauce. I also usually go the Potato Pancake route there too. You ever tried those? That’s what I like to hear, holding it down with Veselka. I haven’t tried anything meat wise but the burger and it was pretty good, not the best I’ve had as Josh Ozersky once claimed, but he’s much more of a purist than I am. After all, you’ve seen my favorite burger at BK Diner. It’s a monster. I’ve seen everyone eating the stuffed cabbage so that must be a good sign. Anyway, next on your brunch list in that hood should be Yuca Bar, great deal on brunch, go for the skirt steak and potatoes and add an order of sweet plantains. Good to hear from you dude, great minds thing alike in regard to the NY-ness of Veselka. Never had either of the dishes you mentioned, its been hard to stray from the ones I posted on, the flavors all work so well together. I’m going to have to branch out though sooner or later. Nice to hear from you. 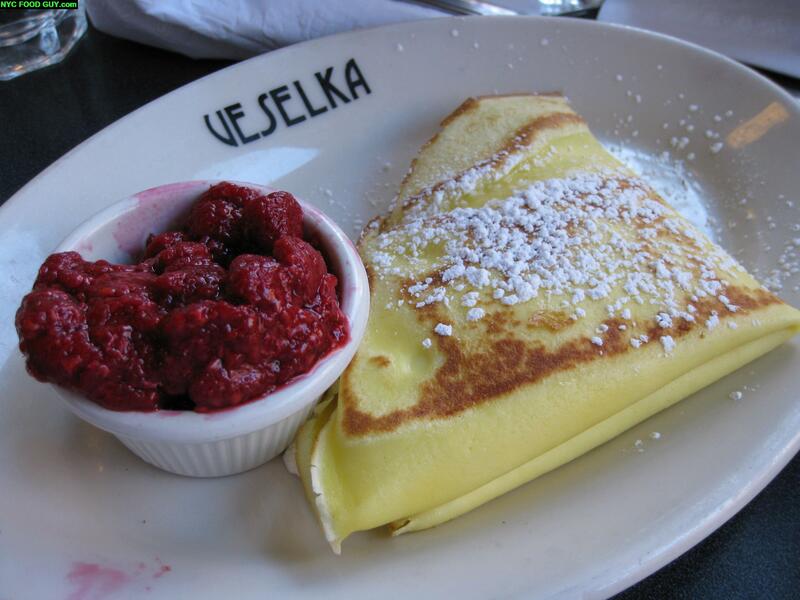 Believe it or not, I’ve never had the potato pancakes at Veselka. How do they stack up to a place like Sarge’s? Where’s the best potato pancakes you’ve had outside a home cooked meal? Ever tried them at B & H Vegetarian? Glad to hear you indulge in the cheese blintze as well, you really can’t go wrong. I’m heading out of town this weekend and won’t be back on the computer until Sunday night so keep the great comments coming and we’ll all catch up then. I look forward to it. Come back tomorrow, however, I’m trying my first automatic post and it involves a mission proposal to all readers. That looks amazing. My grandfather was a Russian Jew and his father’s family came from the Odessa, Ukraine. I always wondered what sort of food they ate. My grandfather taught me to love and cook Chinese not so much Ukrainian food. Now I want to go to this place! It looks FANTASTIC! 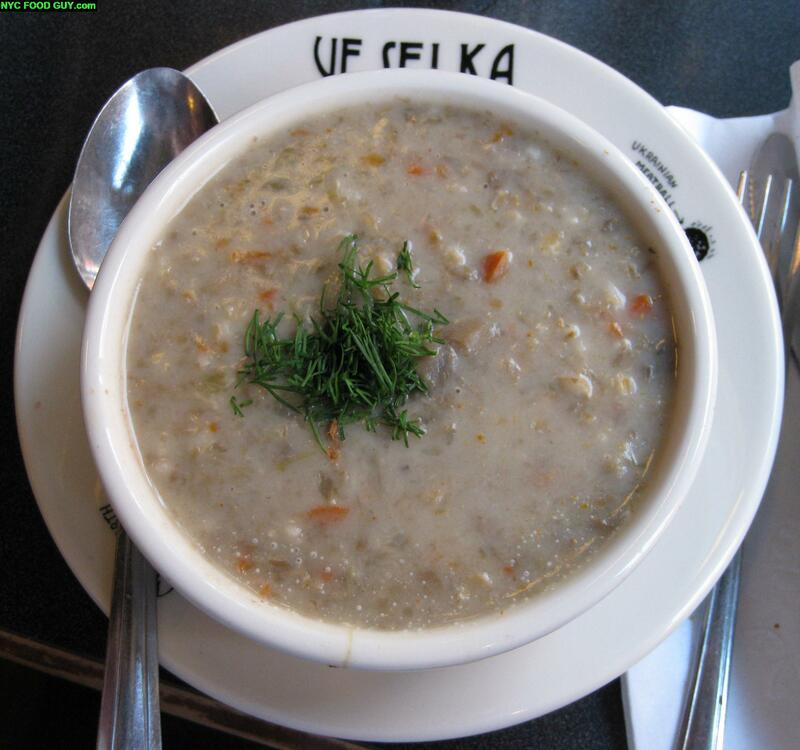 Mushroom Barley soup is one of my favourites, something I discovered in NYC and had never had before. That one looks amazing! All the rest looks amazing too!! I will definitely put this on my list of places to go before I leave!! I would also recommend Neptune, on 1st Ave at 12th St for excellent Polish food. Great peirogies and blintzes, and killer-strong Polish beers. Nice brunch options too, and an outside courtyard when the weather warms up. Wow! no one mentionted the Goulash! It’s moist tender chunks of veal over egg noodles with a nice flavorful broth, hearty as anything else on the menu! A side of servicable cheesy and crisped edge mac& cheese goes well along it side, oh and even more worth mentioning is the awesome horseradish beets!! Sounds pretty righteous. I had some borscht the other day, filled with pork and I added sour cream. Pretty tasty. 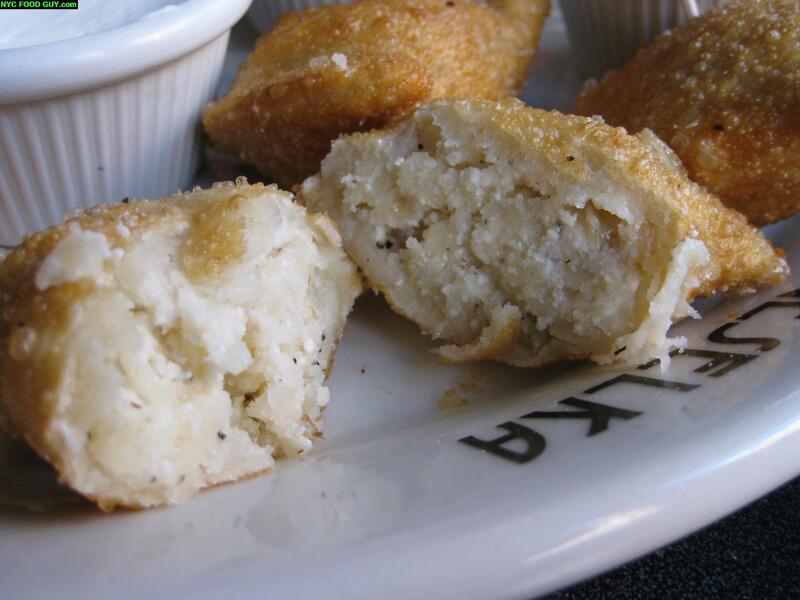 Have you had the potato pierogies? I had kasha mushroom last time I went. Pretty legit.